Cannabalism . . . While Utica Sleeps! Indium Corp. is looking to expand its space of operations by moving into an additional building at 6149 Sutliff Road in Oriskany, company officials said Friday. . . . The 64,000-square-foot building Indium Corp. is looking to purchase has an assessed value of $773,000 . .
Rome Sentinel 7/21/11: Rome? Georgia? China? Indium Corp. wants to open a manufacturing plant in the West Rome Industrial Park and create 30 jobs over time, but the plan comes with some conditions. Before Indium buys and renovates the former ConMed building at 5836 Success Drive, it wants incentives from the county Industrial Development Agency and the state. While Kevin Martin, outside counsel for Indium, says Rome is the preferred location, he notes the company also is considering sites in Fulton County in Georgia, and China. . . .
Indium has its global headquarters in Clinton and a facility in Utica. It has 302 direct employees in Oneida County, plus contract workers that bring the total number to around 400, said Martin. The addition of a Rome plant would not affect employment at the other two locations in the county. The company has already bought the former ConMed building at 5836 Success Drive and begun renovations. The new location will create up to 24 new full-time jobs. Indium currently has about 320 employees at its Clinton and Utica facilities. Empire State Development Corp., New York’s economic development agency, is providing the company with a $347,939 grant to help offset the cost of the purchase of new machinery and equipment, as well as $652,061 in Excelsior Jobs Program tax benefits over five years. The project, estimated at $10 million, includes the relocation and expansion of some operations from Indium’s Lincoln Avenue location in Utica, including existing machinery and equipment. . . .
116,124 square feet . . .
Why should taxpayers participate in this? And where the heck were Utica officials all this time? The answer to the last question may be that Utica officials and residents were already tapped out by this corporate pan-handler . . .
OD Editorial 10/09/2007: Indium deal lacking job information. In its deal between the city of Utica and Indium Corp. that could be worth nearly $1.2 million, it’s not clear to the public whether Indium will be living up to its part of the bargain because it’s not fully forthcoming on job totals and job goals. By refusing to disclose that information, the company fails to provide specifics the public has a right to know as a partner in the deal. That deal was announced last week following preliminary approval by the Utica Industrial Development Corp. of a payment in lieu of taxes (PILOT) program and mortgage recording tax and sales tax exemptions that could total $545,000 over the next decade. That would be in addition to a $600,000 loan, approved by Utica’s Department of Urban and Economic Development in July. . . . The $600,000 “loan” won’t have to be repaid if the company maintains 120 jobs at two Utica sites for five years. 2007 to 2012 is -- 5 years! Yup -- time to move on to the next community teat to milk. Enough is enough. Handouts are wasted money. They do not fix the problem. Indium Corp. will move “selected” operations, including machinery and equipment, from its offices on Lincoln Avenue to a new facility on Success Drive in Rome. The project will be supported by $1 million in a state grant and tax benefits, and $100,000 via the city of Rome. It's interesting how often taxpayers pay for companies to move from Utica to Rome. Now people will have to drive farther (with $4.00/gal gas) to go to work! Even a move to the NH Business Park would have been preferable. Viva la Résistance . . . Per the OD: Utica teachers reject contract: What's next? Monday’s defeat leaves $5.8 million out of the budget that would have restored 90 classroom jobs, including full-day kindergarten. . . . There may be a lot more here than meets the eye. Undoubtedly, some teachers may have voted down the contract out of greed . . . not wanting to give up the pay increases that almost all other public employees have given up. . . and not caring about the public's ability to pay. For many, however, the evaluation portion may be the bigger issue. Instead of being evaluated in accordance with standards set by their supervisors or local board of education, they will be evaluated per standards set in Albany . . . and ultimately Washington where this program is originating. People take on debt to build their homes. The nation is taking on debt also to build a structure: A NATIONAL structure to control our local schools. Control what goes on in our schools, and you control the population. Marketing Effort? . . .
What’s really needed is more aggressive marketing of the airport. That needs to be a combined effort, with the county, Mohawk Valley EDGE and the airport commissioner working in partnership with Million Air — Freeman Holdings’ franchise name — to secure more business. Their success would benefit everyone. The unstated assumption, of course, is that there is a market for what Griffiss has to offer. . . This seems to be a reoccurring error of our "build it and they will come" county leaders who repeatedly show their ignorance of business basics by spending lots of money on facilities without knowing precisely what needs are currently unserved or underserved locally, how local people are coping with their needs, and who this region's competition might be. This blog talked about the County's lack of basic business information back in 2008 for example. While it is possible that there is a perfect niche for Griffiss "International" Airport to fill, it is not clear what that niche might be (though there were signs of needs in the air cargo department about 10 years ago). What is needed is a Marketing STUDY to determine what niches GIA might fill. Diving into an "aggressive marketing effort" without knowing the market may result in Oneida County spending a ton of money and effort on the equivalent of marketing snow to Eskimos. Le Tour . . . Le Tour de France is the world-famous bicycle race ... this year starting in Liège, Belgium, and traveling in stages over a three week period through numerous French cities (and part of Switzerland) from the English Channel south through the Alps to the Mediterranean Sea, then west to the Pyrenees Mountains then north to end on that famous Boulevard in Paris, Les Champs-Élysées (which handles some 90,000 cars a day when Le Tour isn't running). People far and wide follow the Tour de France . . . Win it, and you are an international star. But Le Tour de France is not the only bicycle Tour . . . Le Tour d'Utica is . . . not quite as famous . . . nor nearly as long (about three hours) . . . and not even a race. It's just a time for bicycle enthusiasts to get together and have some fun taking a themed tour of their favorite city -- or least the one that they are closest to. This year's theme is coffee ... and several stops are planned with coffee in mind. 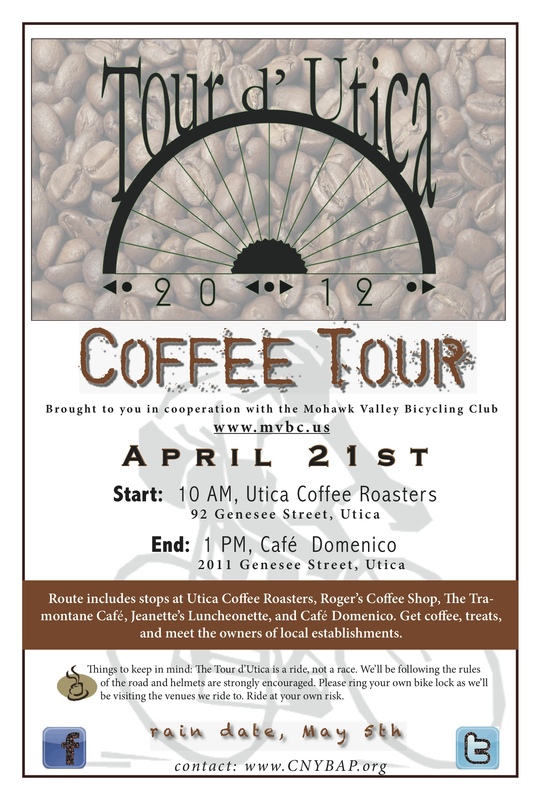 So while Tour de France followers may want to check out the champagne cellars in Epernay, France, Tour d'Utica participants can check out the roaster at Utica Coffee Roasters on Baggs Square West. Click on the image at left or visit the CNY-BAP home page for more details. Join in the fun . . . You might even spot a famous gold bicycle on your ride. Going Batty in New Hartford . . . Per the OD: Newest obstacle in N. Hartford storm-water project? Bats The endangered species Indiana Bat to be exact . . . The town is working to improve storm-water drainage in areas that have historically been impacted by flooding. . . . But while environmental scientists were examining the upper portion of Beechwood Road, where phase two of the project will begin, they noted that the clearing and removal of trees may interfere with the bat species, said Senior Managing Engineer Charles White of Barton & Loguidice. The firm alerted the Town Board of the issue earlier this month. Now, Barton & Loguidice will perform an environmental study costing about $11,000 to identify if the bats are in fact roosting in the trees. . . .
Why spend money studying bats when tree-cutting can be timed for when they won't be around? Not Budging . . .
At least that was the overall impression left after attending a rather frustrating meeting last evening with DOT officials about our favorite topic: The North-South Arterial. Oh it was not that blatant. There were the usual conciliatory tones that DOT is looking into "this" or "that" alternative. . . but we've been through the drill often enough to know that DOT only looks far enough to justify its own position which can be summarized as "My way IS the highway." Then it becomes a matter of "expertise" (members of the public are not traffic engineers, you know) and current highway standards require X,Y and Z (i.e., DOT can't accommodate those needs). The bottom line is that it's always a highway. The inescapable fact is that the N-S Arterial is also a street -- an integral part of Utica's street grid -- but the proposal continues a 50 year tradition of making that local street system less functional by forcing people to drive out of their way for short local trips and to follow routes that are not intuitive. Several Utica Council members being in attendance was no help. Holding on to 62 million dollars seems to be their main concern as opposed to the dysfunction that 62 million will create in the Utica street grid. If I hear that we need to take a "regional" perspective of the highway design one more time from one of these people it will be one time too many. Utica residents and businesses should not have to be inconvenienced to meet a "regional" need. If Utica goes down the toilet, the whole region will follow. The take-away is that Sunset Avenue will ultimately be closed and a pedestrian bridge that few will use will take its place. Is DOT really incapable of designing a city street or streets that can accommodate the traffic of those who merely want to pass through? Somehow I find that hard to believe.